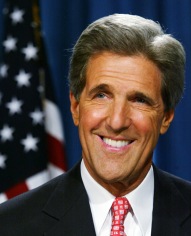 Hello my name is John Kerry and man I just can't get enough of these here "blogs"!!! I just love 'em! Can't get enough of 'em! Blogs, blogs, blogs! Just shovel them down my esophagus, yes that's right just cram 'em on down! I'm a rampant blogoholic and I need blogohol to in order to live! My wife loves 'em too - can't seem to drag her away from those "podcast" things! Sometimes she even prints out some of the blogs and saves them along with her recipes in a scrapbook! Maybe she should call it a "scrapblog"!!! Ha ha! More blog-o-tine please!!!!!! !